These stocks could be toxic to your portfolio in the month ahead. Editors' pick: Originally published Sept. 23. The first day of fall kicked off on a strong note for stocks. All three of the big market averages ended materially higher on the day, the Nasdaq Composite knocking out an all-time record close by the time Thursday's trading session ended. At last count, that means that the S&P 500 is back on track to end the year with double-digit gains again. But while the headline stats look great for the stock market, there's a different story brewing in the individual stocks. As I write, 15% of S&P 500 components are down 10% or more since the start of 2016. And nearly one in four S&P stocks is down 5% or more. That's a pretty big chunk of the market that's not participating in the upside this fall. The good news is that some of the most treacherous trades are tipping investors off ahead of time. To figure out which stocks to steer clear of, we're turning to the charts today for a technical look at five stocks that could be toxic for your portfolio in the month ahead. For the unfamiliar, technical analysis is a way for investors to quantify qualitative factors, such as investor psychology, based on a stock's price action and trends. Once the domain of cloistered trading teams on Wall Street, technicals can help top traders make consistently profitable trades and can aid fundamental investors in better entry and exit points. Just so we're clear, the companies I'm talking about today are hardly junk. By that, I mean they're not next up in line at bankruptcy court -- and many of them have very strong businesses. But that's frankly irrelevant to what happens to their stocks; from a technical analysis standpoint, sellers are shoving around these toxic stocks right now. For that reason, fundamental investors need to decide how long they're willing to take the pain if they want to hold onto these firms in the weeks and months ahead. And for investors looking to buy one of these positions, it makes sense to wait for more favorable technical conditions (and a lower share price) before piling in. So without further ado, let's take a look at five toxic stocks to sell. Up first is telecom company America Movil (AMX - Get Report) . This $39 billion telco has been a hard stock for shareholders to like in 2016, down more than 16% since the start of the year. The bad news is that shares could be about to kick off a second leg higher if certain conditions are met. Here's how to trade it. America Movil is currently forming a descending triangle pattern, a bearish continuation setup that's formed by horizontal support down below shares (at $11.25 in this case) and downtrending resistance to the top side. Basically, as America Movil bounces in between those two technically significant price levels, shares have been getting squeezed closer and closer to a breakdown through their $11.25 price floor. If and when that happens, we've got a new sell signal in this big phone company. Relative strength, which measures America Movil's price performance vs. the rest of the stock market, adds another red flag to the stock chart. That's because relative strength has been in a downtrend since the end of April, signaling that shares are continuing to underperform the S&P 500 right now, even though it looks like the downtrend has flattened out. 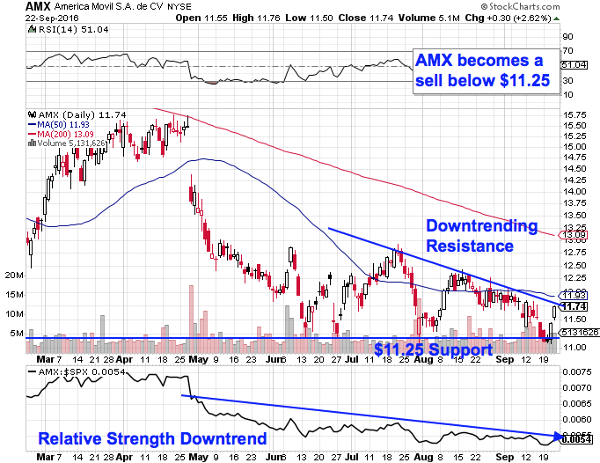 If $11.25 gets violated, it's time to be a seller in AMX. The exact same price setup is in play with shares of $1.1 billion shipping company Frontline (FRO - Get Report) . Frontline has lost more than 42% of its market value in the last year on a total returns basis, and now shares are threatening a second leg lower with a descending triangle setup of their own. 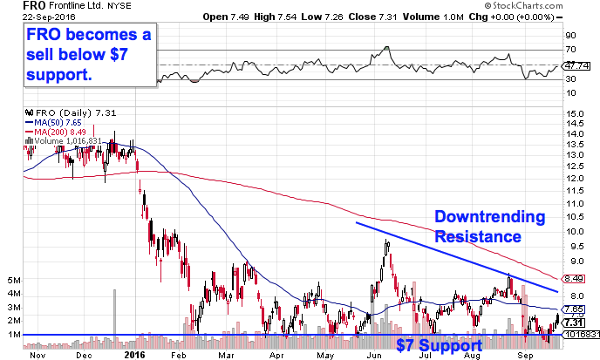 For Frontline, the price level to watch is support down at $7. What makes that $7 level in particular so significant? It all comes down to buyers and sellers. Price patterns, like this descending triangle setup in Frontline, are a good quick way to identify what's going on in the price action, but they're not the actual reason it's tradable. Instead, the "why" comes down to basic supply and demand for shares of the stock itself. The $7 support level in Frontline is a place where there has been an excess of demand for shares; in other words, it's a spot where buyers have been more eager to step in and buy shares than sellers have been to take gains. That's what makes a breakdown below $7 so significant -- the move would mean that sellers are finally strong enough to absorb all of the excess demand at that price level. Keep an eye on that $7 level in the weeks ahead. Meanwhile, GlaxoSmithKline (GSK - Get Report) is actually having a solid year in 2016. Since the calendar flipped to January, this $104 billion pharmaceutical stock has made its way 8% higher, besting most of the other stocks in its sector. But GSK shareholders might want to start thinking about taking some of those gains off the table here. This stock is beginning to show some cracks. GlaxoSmithKline is currently forming a rounding top, a bearish reversal pattern that looks just like it sounds. The rounding top indicates a gradual shift in control from buyers to sellers, and it triggers when the support level that's defined the bottom of the price pattern gets violated. 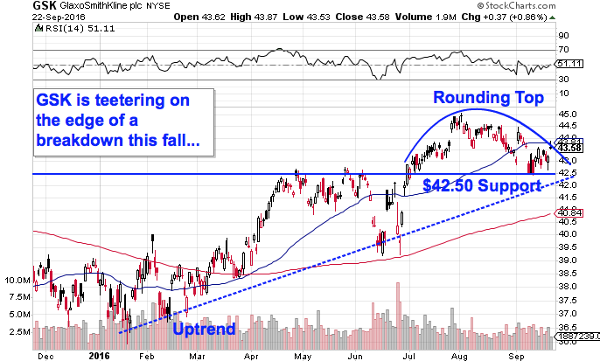 For GSK, the key breakdown level to watch is $42.50 support. Notably, a violation of that support level would coincide with a breakdown below the uptrend from this stock's 2016 highs. That adds considerable downside confirmation if the move does happen. "If" is the operative word here. Remember, technical analysis is a risk management tool, not a crystal ball. So, like with any of the other trades on our list of stocks today, GSK doesn't actually become a high-probability downside move until its $42.50 support level gets violated. Until then, it's waving a caution flag. Things have been pretty straightforward in shares of Tesoro Logistics (TLLP lately. Since this stock peaked back in late May, shares have been selling off in a well-defined (albeit shallow) downtrend working their way lower for much of 2016. And now, as shares test the top of their price channel for a fifth time, it makes sense to sell the next bounce lower. 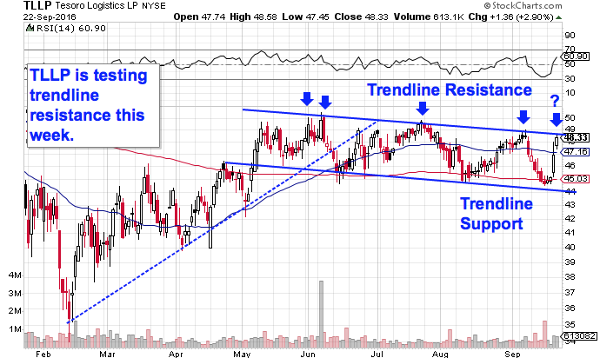 The price channel in Tesoro is formed by a pair of parallel trend lines that have corralled nearly all of this stock's price action since shares peaked at the start of the summer. And shares have reacted to those trend lines very consistently; every test of the top of the channel has given sellers their best opportunity to get out before this stock's subsequent leg lower. The next down day in Tesoro is a sell signal. Waiting for that bounce lower before clicking "sell" is a critical part of risk management for two big reasons: It's the spot where prices are the highest within the channel, and alternatively it's the spot where you'll get the first indication that the downtrend is ending. Remember, all trend lines do eventually break, but by actually waiting for the bounce to happen first, you're confirming that sellers are still in control before you unload shares of Tesoro Logistics. Another energy stock that's looking increasingly risky right now is $51 billion oil and gas firm Statoil (STO . While Statoil has participated in the energy sector rebound this year, rallying more than 13% in the process, shares have spent the last several months carving out a classic reversal pattern. The sell signal comes on a breakdown below $14.75. Statoil's price pattern is a head and shoulders top, a reversal pattern that signals exhaustion among buyers. 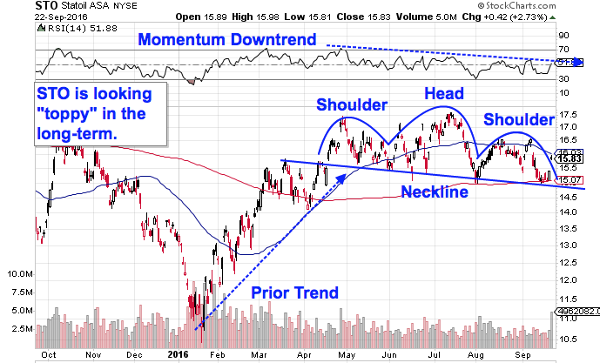 The setup is formed by two swing highs that top out at approximately the same level (the shoulders), separated by a higher high (the head). The sell signal comes on a breakdown through Statoil's neckline, down at the aforementioned $14.75 level. Despite yesterday's rebound in the energy sector, Statoil's share price is still stuck in the right shoulder of the price pattern. Price momentum is an extra signal that the buying pressure is under pressure in Statoil. That's because our 14-day RSI line has made a series of lower highs since the pattern started forming, signaling that buyers are losing control of things as shares track sideways this fall. If $14.75 gets violated, this stock opens up a lot more downside risk. Disclosure: This article is commentary by an independent contributor. At the time of publication, the author held no positions in the stocks mentioned.